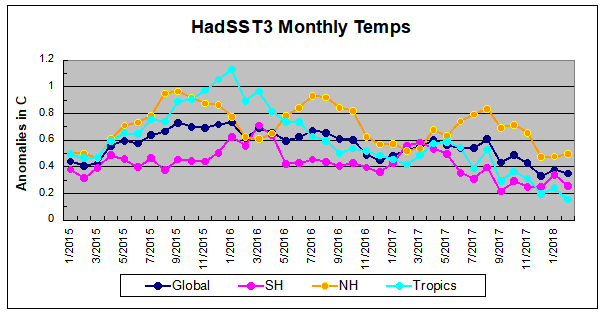 The chart below shows SST monthly anomalies as reported in HadSST3 starting in 2015 through March 2018. A global cooling pattern has persisted, seen clearly in the Tropics since its peak in 2016, joined by NH and SH dropping since last August. Upward bumps occurred last October, in January and again in March 2018. Three months of 2018 now show slight warming since the low point of December 2017. Only the Tropics are showing temps the lowest in this time frame. Globally, and in both hemispheres anomalies closely match March 2015. With ocean temps positioned the same as three years ago, we can only wait and see whether the previous cycle will repeat or something different appears. As the analysis belows shows, the North Atlantic has been the wild card bringing warming this decade, and cooling will depend upon a phase shift in that region. To paraphrase the wheel of fortune carnival barker: “Down and down she goes, where she stops nobody knows.” As this month shows, nature moves in cycles, not straight lines, and human forecasts and projections are tenuous at best.